We live in a polluted environment, but a lot of people are starting to make some efforts to help change this. While some have long believed that one person can’t make a difference, public attitude seems to be changing. There are lots of ways in which each one of us can live a little bit greener and be that change that we want to see in the world. One of the ways is through composting. When you prepare a meal, have a look at the things that go into the trash. There may be potato skins, banana peels, pepper or tomato tops, egg cartons, leftover salad, and so on. These things need not be thrown away and contribute to pollution. Rather, you can recycle them and turn them into compost, which becomes a fertilizer for your garden, creating beautiful flowers or, even better, new edible produce. If you want to try composting, you may wonder where to start. One option that is available is the Hot Frog composter, classed by many as one of the best. So what is it, and is it any good for you? When you purchase your Hot Frog, you will first of all find that it is incredibly easy to setup. In fact, all you need is an adjustable wrench and a screwdriver. It comes with easy to follow instructions, so you should have it put up in no time. You will also notice that it comes with a heavy duty frame, making the whole composter very sturdy once it is set up. One of the things people like about this composter in particular is that it is not too large, and very easy to use. This means it is also easy for the children to get involved in composting, learning about recycling and how to keep the planet a greener, more sustainable place. Being a dual body model, it obviously has more than one bin. This means that you can fill the first bin and start using the compost while you fill up the second one. When you spin the composter, the material falls over the center bar, which breaks it up. Getting to your compost is also very simple, as you can simply slide a bin over a piece of tarp and tip it. 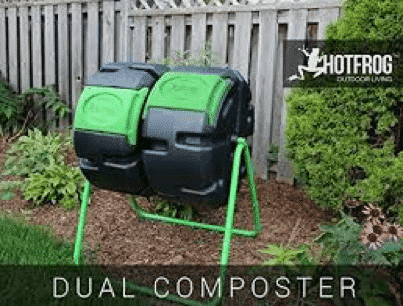 It is important to note that Hot Frog is an established name in the world of composters, and the Dual Boy Tumbling Composter is actually an amalgamation of two of their most popular models. It has two bodies, just like the YIMBY IM400, and it uses the rotation found in the RM4000 “Roto”. This means that the composter bodies also come fully assembled. Once you start filling up your composter, you have to turn it five to six times every other day or so. If the conditions are perfect, you could have compost in as little as two weeks, although it usually takes a little bit longer. It also has excellent aeration holes and deep fins. Put together, they break up the clumps while adding oxygen to the mixture as well. As a tumbling composter, aeration is far superior to that found on other models. The frame of the composter is made from painted galvanized steel. Meanwhile, the bins are made from BPA-free UV inhibited recycled polyethylene. Because this is recycled, you also make further contributions to being green, while at the same time knowing that no harmful toxins are added to your compost. Best of all, both materials are long-lasting and they will look great as well. Under perfect conditions, it processes compost very quickly. The frame is very sturdy and built to last. The bins are made of recycled plastic, meaning you already make a positive contribution to the environment. Tumbling composters have excellent aeration, leading to compost that is high in nutrients very quickly. Some people have reported that composting time can be somewhat slow. It is made in China, which has made some people question its durability. However, being a reasonably new composter model, this question cannot be answered yet. Is The Hot Frog Right For Me? 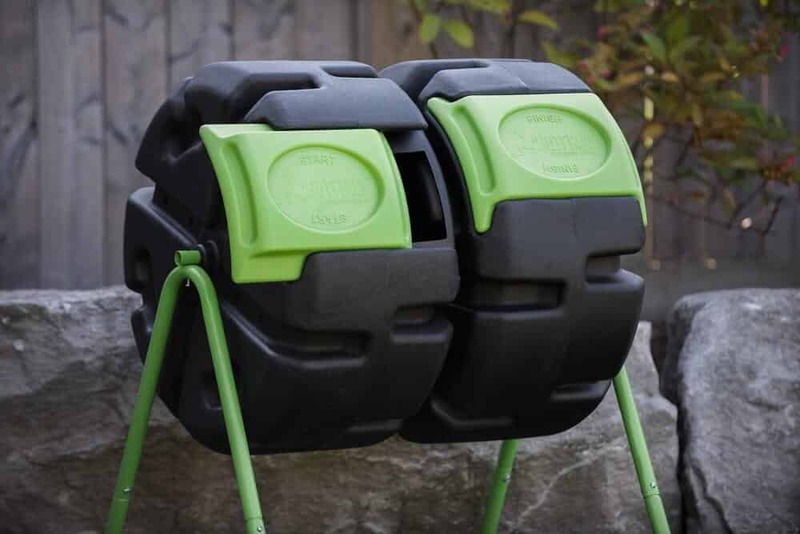 There are very few things that the company could do to make their Dual Body Tumbling Composter any better than what it is today. The nuts and bolts could be oiled a little bit better, but that is a personal opinion and also a problem that is quickly resolved with a little WD40. The tumbler is designed for smaller households, however, which means that you might struggle to use it properly if you have a lot of waste. It isn’t that the composter can’t handle it, but rather that the doors are quite small, which means it could get a little bit messy if you were to put a lot in, or take a lot out in one go. 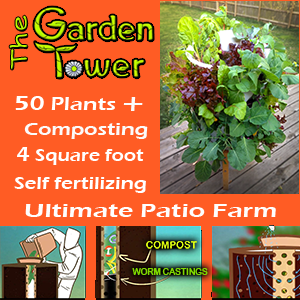 Overall, this is the perfect tool for small to medium-sized households who want to live in a more sustainable way and create their own high quality, nutrient-rich compost. 100% recommend. Check Out The HOT FROG NOW!